I just finished reading Missing, Presumed by Susie Steiner (Random House, 2016). This is a complex suspense story told with skill and insight. The author is a journalist and featured writer for The Guardian, and she takes advantage of her experiences in the press to subtly critique the devastating effects that media exposure can have on individuals caught up in a criminal investigation. The story centers around two weary police officers, bored with their night-shift responsibilities, who eagerly grab the chance to take the lead on a missing persons case. Manon and Davy fulfill many of the typical buddy-cop tropes: Manon is female, late thirties, and jaded by the job and her disastrous love life; Davy is male, twenty-something, optimistic and upbeat, and happily occupied with his steady girlfriend and his volunteer work with underprivileged youth. The missing person is Edith Hind, the beautiful and accomplished daughter of a wealthy and well-connected doctor, Sir Ian Hind, and his wife, Miriam. Edith and her live-in boyfriend, Will Carter, are post-grad students at Cambridge. It’s Will who discovers that Edith is missing and reports her disappearance to the police. Evidence found in Edith’s house lead the police to conclude that foul play might be involved, and that the “misper,” Edith, might be in danger. The investigation also reveals the fact that Edith was last seen in the company of her best friend, Helena. So far, this may seem to be a common, trite, and derivative story, one that we’ve seen on TV and in movies dozens of times. What sets this story apart from others is the author’s skillful use of point-of-view. Each chapter is told from the viewpoint of one of the main characters–detectives Manon and Davy, mother Miriam, and friend Helena. It’s Manon’s viewpoint that dominates the narrative, however, and therefore it is her character that is the most completely developed. There is humor to be found in the way she sees herself versus the way the other character view her. We discover that her acerbic wit and grouchy misanthropy form a protective shell around a heart that has been hurt and disappointed too many times. Again, this may seem like a standard, worn-out character type, but Steiner’s honest portrayal of Manon’s grudges, self-doubts, failures, and suspicions, as well as her genuine sympathy and dogged determination to solve the case help us to care deeply about Manon. The same holds true for the other characters. We glimpse into the heart of a mother who can’t accept the possibility that her daughter might be gone forever. We agonize with the friend whose private life is painfully exposed to the public just because of her association with the missing girl. We marvel at the resilient idealism of a young man whose earnest desire is to do good in the face of frustrating obstacles. Finally, we peek into the insatiable greed for salacious gossip and sensational headlines that has become the hallmark of the modern-day press. An unexpected plunge into romance, a seemingly unrelated murder, and a heart-breaking look into the complexities involved in helping at-risk urban youth round out this satisfying police-procedural novel. I have only one caveat: because the story takes place in England, the author employs acronyms and other terminology that may be difficult for the American reader to decode. Having said that, however, I thoroughly enjoyed this book and will highly recommend it. The story is engaging and features enough revelations and plot twists to satisfy a mystery-lover like myself. Manon and the other characters will stay with me for a long time. Jesus told his disciples, “You are the light of the world.” (Matt. 5:14) As believers, we try to take that task seriously. Christians should provide illumination and dispel the darkness of the world. In the previous verse, Matthew 5:13, Jesus likens his followers to salt – “the salt of the earth.” Salt has gotten a bad reputation in the last several years because overuse can lead to health problems. But in the ancient world, salt was essential for preserving food and bringing out its flavor. So we, as Christians, are charged with preserving the world and making life palatable. These two concepts, “salt and light,” have become very popular with Christians in recent years – we are always being encouraged to be salt and light in the world. So lately I’ve been thinking about what that means, especially concerning the idea of light, and here are some of my tentative conclusions. So I think another helpful metaphor might be found in the moon. We know that the moon is not a source of light itself. It shines only because it reflects. The moon is useful at night because the world is enveloped in darkness; while the moon’s glow is dim, it’s better than nothing. However, it certainly could not replace the sun. The sun is the source of power, radiation, warmth, and life. The moon is not really the source of anything, other than the slight gravitational pull that creates the tides. I think this is how we should view ourselves and our relationship to our Creator. He is the source of everything, including the sun. He gives us our power, our life. All we can do is reflect him to the world in darkness. And here’s the most important point of this metaphor: we can only shed a powerful light when there’s nothing between us and God. When the moon is full, it shines brightly and lights up the earth. The light is incomplete – colors are lost, and details may not be clear. But the light is sufficient to guide the way through the darkness until the world returns to the sun. But when the moon is “new,” no light issues forth at all. The world is dark; travelers lose their way. Why? Because the earth stands between the moon and the sun, blocking the source of light, blocking the moon’s ability to reflect. How often have I let the world come between me and God, so that I don’t reflect him at all? Yes, I realize this analogy is flawed. The moon doesn’t choose its position in the sky relative to the sun and the earth. The moon can’t be held responsible for being “new” anymore than it can be celebrated for being full. But we can choose our position in relation to the Son, the source of our light. We can let the world get in the way; in fact, we can hide behind the world. Or, like the half moon or crescent moon, we can let our light be diminished because the world is blocking our full access to the source of light. In this scenario, we are living in the night. Until the dawn arrives and Christ returns, the world depends upon us to reflect his light into the darkness. Clouds of sin, confusion, and distraction may block or diffuse the light we reflect. If the light is to penetrate the clouds and illuminate the night, we must position ourselves to be fully reflecting the source of light by clearing away any obstacles that remain between us and God. I’m not sure I know how to do this. I’m not sure I know how to move away from the world that distracts me, that blocks me from the source. But I want to try. I suspect that I need to stop scooting around from spot to spot and allow God himself to place me in the position that will allow me to be the reflector he created me to be. I try to take that message to heart – to avoid envy or pride. Still, I consistently find myself rejoicing over the fact that God granted me the gift of music. The process of rehearsing and performing with the church choir, or practicing with the praise band, fills me with satisfaction and gratitude. The words of the songs are energized by their musical context, and they fill my heart with joy and with a deep sense of fulfillment. With repeated rehearsal, the lyrics settle themselves into my heart and mind and become a very real part of who I am and how I think. But the process of practicing involves more than just the words of the songs – the melodies, harmonies, phrases, and interludes speak their own mysterious, whispering messages to my soul. This may sound really strange to some people. I would guess that most people would assume that practicing would be tedious, repetitious, even boring. Occasionally that may be true, but only infrequently, at least in my experience as a church musician. What, if anything, lifts the rehearsal experience beyond the pedestrian and on to the level of transcendence? Beyond that, why is the experience of performance, of mutual music-making, so exhilarating, so much pure fun? A few days after the conversation at the restaurant, I read a review of a new book titled Love 2.0: How Our Supreme Emotion Affects Everything We Feel, Think, Do, and Become by psychologist Barbara Fredrickson. (Read the article for yourself here.) The author’s project in this book is to explain the neurobiological, physical, bodily implications of love. As I read through the review of this book on one of my favorite blogs, Brain Pickings, some of the reviewer’s remarks sparked some connections in my brain with the thoughts on music I had been exploring earlier in the week. Allow me to share some of these connections here. Fredrickson states, “Perhaps counterintuitively, love is far more ubiquitous than you ever thought possible for the simple fact that love is connection… The new take on love that I want to share with you is this: Love blossoms virtually anytime two or more people — even strangers — connect over a shared positive emotion, be it mild or strong.” When I read this, I immediately thought of the shared positive emotions experienced, for example, during a typical choir rehearsal. We laugh together; we sing together; we strive for improvement, if not perfection, together. We hear each others’ voices, strong or weak, and we share the task of blending our voices together, in harmony or unison, to make pleasing, even beautiful, sounds. We definitely fit the definition Fredrickson provides: a group of people connecting over a shared, strong, positive emotion. If we accept her premise, then what we experience when we sing together is nothing short of love itself. We feel love, we share love, we are immersed in love. No wonder we leave the rehearsal space feeling better, more alive (although maybe more tired) than when we entered. When I first read this, I was immediately struck by the implications this theory would have regarding my ruminations on my music-making activities. What could be a more positive shared experience than that of making music? What could be a more perfect conduit for reverberating connections between people than the blending of voices, the most personal of musical instruments, in the act of singing? Add to that heady mixture the emotional intensity of expressing faith through praise, in songs that relate the truths of the Bible and meditate on the qualities of our God. I realize, however, that this “positivity resonance” is not exclusive to church choirs or church musicians. My daughter and several of my friends sing in a community chorus that practices every Thursday night. Most of the members work a full, eight-hour day, and then spend an additional three hours in rehearsal. You would think that these chorus members would come home exhausted and ready for bed, but this is not the case. They are full of energy, hyped-up and euphoric, and have trouble settling down and preparing for sleep. In fact, my daughter and some of her friends have dubbed this condition “Post-Chorale Syndrome,” in recognition of the heightened state of awareness and vitality they encounter each week, both during and after chorale practice. E.T. : The Extra-Terrestrial, 1982. Directed by Steven Spielberg, and starring Henry Thomas, Drew Barrymore, Peter Coyote, and Dee Wallace. As #24 on the AFI Top 100 List, E.T. was my next film to watch for my Top 25 project (for more info on this project, see this post). Although E.T. was one of the films that I was already familiar with, it had been a long time since I had seen it from start to finish — probably close to twenty years, at least. So while I did have some idea of what to expect from this film, my expectations were cloudy and incomplete at best. Steven Spielberg is a wonderful director and a consummate story-teller, and this story was perfect for his style. It possesses a satisfying narrative unity – it’s the kind of story that makes the viewer care about the outcome and care about the characters. In addition to the emotional resonance this film carries, Spielberg endowed it with beautiful visual spectacles, taking advantage of the hilly suburban terrain of the setting to create tension and develop stunningly beautiful shots while keeping the story based firmly in a familiar reality. Spielberg is masterful at creating suspension, and with this story his techniques were simple but effective. From the beginning of the film we catch glimpses of the eponymous alien, but we only see him in silhouette or from behind. Little by little, we are shown a finger here, a foot there, a shoulder, an arm. This technique creates an intensified interest in the film: when do we get to finally SEE him? When Elliot’s flashlight first illuminates the alien’s face, we are as stunned as he is. Spielberg does the same thing with the government agents pursuing the alien. We keep seeing a man’s torso, with keys dangling from his belt, but we don’t see his face until almost the end of the picture. In fact, in the credits, the actor playing this man, Peter Coyote, is named simply “Keys.” The other agents working with this man are equally faceless and nameless. Even when they interact with the central characters of the story, most of them are wearing space suits with helmets that obscure their faces. They are meant to represent the unsympathetic, mechanistic acts of big government – an anonymous entity that refuses to listen to the desperate pleas of a young boy. I love the way Spielberg utilizes the hills of Elliot’s neighborhood in so many interesting ways. On one occasion we see the ominous helmet tops of the space-suited agents rising up from the hillside as they march toward Elliot’s home. Later, he uses the same effect to reveal the police cars chasing the boys as they aid in E.T.’s escape. In another shot, we see the boys silhouetted against the setting sun as they ride their bikes across the horizon. The hills create an exciting setting for the chase scene as well — the police and government cars can’t easily follow the boys’ bikes as they leap over the terraced hillside of a housing development, giving the children a distinct advantage over the might of the adults. 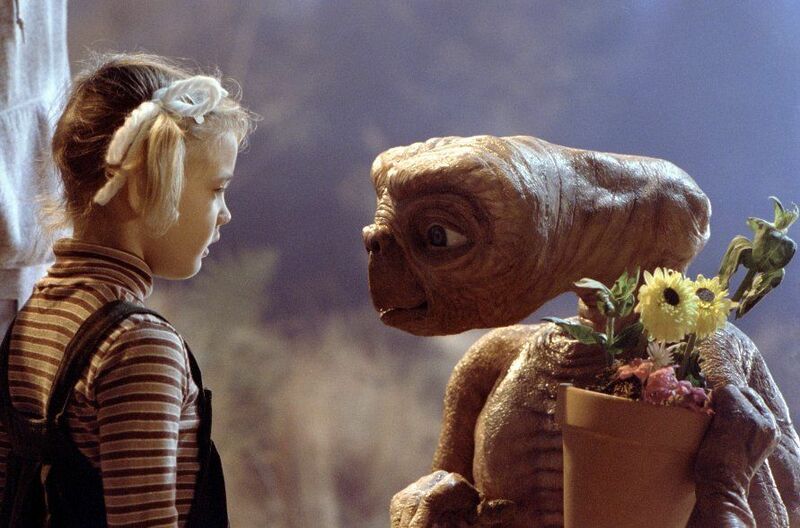 The most exhilarating and definitely most memorable moment of the film is when Elliot is carrying E.T. in his bicycle basket and takes off flying into the sky due to E.T.’s supernatural abilities. The shot of Elliot’s bike passing across the face of the moon is so iconic that it has become the symbol for not only this film, but also provided inspiration for the logo of Spielberg’s DreamWorks studio. One thing I had forgotten was the second time in the film that this technique is used. Against the backdrop of the setting sun, the four boys on bicycles who are taking E.T. back to the forest rise up to fly in silhouette. This is a stunning effect. Another interesting aspect of the film was the medical scenes involving Elliot and E.T. When E.T. appears to be dying, the medical personnel talk over each other, push each other out of the way, and try all different kinds of procedures in an effort to save his life. It is extremely realistic and exciting. I was surprised to learn that these “actors” were in fact real doctors – Spielberg’s own internist and a bunch of his colleagues and friends. Spielberg said that he could never have scripted something so realistic, and that actors would have had a very hard time spouting all that medical terminology. But these doctors slipped into the roles they were so comfortable performing in real life, even though they were “working” on an animatronic puppet, and brought a realism to these scenes that would be almost impossible to replica te otherwise. I think one thing that makes this film so successful is the honest and heartfelt acting by the children, especially Henry Thomas as Elliot. In one of the DVD’s special features, the actors are brought together 20 years after the release of the film to discuss their memories and experiences. All of the actors talked about the fact that the E.T. puppet was so realistic that they actually experienced real feelings for it. Drew Barrymore (who was six when she participated in this film) said that while on the one hand she knew that it wasn’t a real creature, on the other hand she came to love it and believe in it, as though it was one of her real friends. Henry Thomas remarked that the eyes were very expressive, and I think he has touched on the key to this film’s success. The animatronics effects were so advanced and so lifelike that even adults could sympathize with the alien and his predicament. Therefore, I think the reason this film made it into the top 25 is due to its emotional resonance, its stunning visual effects, and its ground-breaking portrayal of a space alien as a sympathetic and likable creature. Its emphasis on friendship, loyalty, and the courage to do what’s right regardless of the consequences has endeared this film to the American and worldwide film audience. 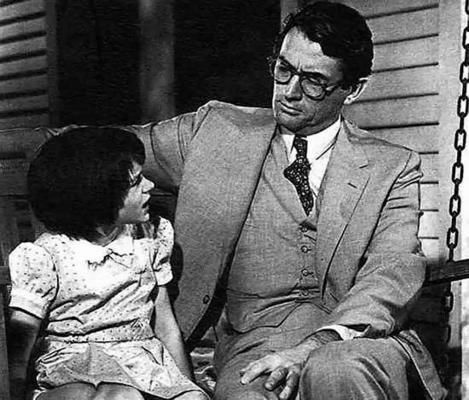 Gregory Peck as Atticus Finch and Mary Badham as Scout in To Kill A Mockingbird. To Kill a Mockingbird, 1962. Directed by Robert Mulligan, and starring Gregory Peck and Robert Duvall. When I have admitted that I had never seen To Kill a Mockingbird until two weeks ago, many people, especially my younger friends, have expressed astonishment. Most have indicated to me that they saw it in high school when they read the book for their English classes. So then I am forced to explain that I’m so old that we didn’t HAVE easy access to movies when I was in school. I finished high school in 1972, at least 10 years before the advent of the VCR, VHS and Beta tapes, etc. Back when I was in school, we used film reels threaded through clunky projectors manned by the geeky AV kids in order to see a movie in class. As I recall, we hardly ever saw a movie in class! Occasionally we would be herded into the school auditorium to see a film, but these were usually educational films about the dangers of drugs or drunk driving — not theatrical release-type films. And the chances of catching it on TV were slim, too, because we only had five channels in those days: ABC (8), NBC (5), CBS (4), the local channel 11, and the PBS channel 13. Most programming ended at midnight, and the older movies that were frequently shown as reruns were mostly of the B-grade variety — space and horror films, teen exploitation and beach romances, or gritty cop dramas. I do remember reading the book, but I have to confess that, until watching the film, I didn’t remember very much about the story. So I embarked upon my Top 25 project (see my previous post for an explanation of this endeavor) by watching a movie I had never seen before, To Kill a Mockingbird. I don’t believe I carried many preconceptions into this venture, other than the belief that this movie would be moving and well-made. (Obviously, since it’s listed in the Top 25!) What I didn’t expect was the amount of gentle humor in the film, for the most part due to the delightful children portraying Scout, Jem, and Dill. In an era when most children portrayed in movies were overly cute and precocious, it must have been refreshing to watch such unaffected, naturally authentic performances. I especially loved Scout’s ham costume! Jem’s reactions to his little sister – annoyance alternating with protectiveness – were touchingly sweet and felt real to me. The one scene that seemed a bit contrived to me was the night at the courthouse, when Scout’s innocent questions help to diffuse the tension between her father Atticus and the riled-up menfolk of the town who seem determined to lynch Tom Robinson before his trial. I just don’t think a 6-year-old girl would continue to speak up when her questions were so thoroughly rebuffed. I know that scene serves a definite purpose, but it just seemed… I don’t know. Too easy? Perhaps Scout’s performance seemed coached? I’m not sure, but it just didn’t ring as true as the rest of the action involving the children. I think the most important aspect of this film was Gregory Peck’s quiet dignity as Atticus Finch and the respect he showed for every character in the story. His interactions with Tom Robinson and his family were beautifully under-played: he was neither patronizing nor overly familiar. His interactions with his housekeeper, Calpurnia, were similarly restrained, yet respectful. The examples he set for the children in his interactions with Scout’s underfed classmate, Walter Cunningham Jr., and Walter’s father who was forced to pay off his debt to Finch with produce, and even with the infamous Boo Radley, were more than simple life lessons from father to child – they also served as models of dignity, class, and fairness to the American movie-going public. Even when the reprehensible Bob Ewell spits in his face, Peck’s Atticus Finch never stoops to seek revenge. His lack of reaction is what truly condemns Ewell in the eyes of the Finch children, the Robinson family, and in the eyes of the film’s viewers. One thing that I really appreciated about this film was its slow and measured pace, but this might be a hindrance to younger audiences today who are more accustomed to the rapid-fire editing of the blockbuster style. Mulligan’s directing lets the story breathe, and creates a very credible atmosphere of small-town life in the Great Depression South. The deliberate pacing of the courtroom scenes established palpable tension while remaining true to the time period and spirit of the book. I also appreciated some of the interesting camera angles utilized in the courtroom scene. The societal and cultural divisions between the races were eloquently demonstrated in shots that incorporated the views of spectators on the floor of the courtroom and in the balcony. I had noticed Robert Duvall’s name in the credits when the film started, so I kept watching to see when he would pop up. I expected that maybe he would be one of the townfolk, but I never anticipated his role as Boo Radley! After the way the children talked about Boo, as well as what Dill’s aunt had to say on the subject, I expected Boo to be more visibly frightening – perhaps deformed in some way. (Maybe I was expecting someone like “Sloth” in the Goonies movie?) But Duvall, consummate actor that he is, was able to create a frightening, yet sympathetic, character just by facial expression and eye movement (with the help of some low-angle, atmospheric lighting). How young he looked there! Boo Radley, by the way, was his first major role in a motion picture. Although the story is set in the 1930’s, this film was released in 1962. This was a time of increasing racial tension throughout the country — Martin Luther King’s “I Have a Dream” speech was delivered in 1963 — and this movie must have had a positive influence on many who saw it during that time. I believe it is for this reason, as well as for Peck’s masterful performance, that this movie was listed in the Top 25. I teach a class called “Introduction to Fine Arts.” It’s a survey-type course, designed as the standard arts-appreciation component of a university’s core curriculum. In addition to critical theory, we cover painting, photography, sculpture, architecture, music, dance, drama, film, and TV/video all in one semester. When I inherited the course from the previous professor, the assignment for the unit on film asked students to watch and comment on any Oscar-winning movie. Because the Academy Awards can sometimes be based on political or sentimental motivations, rather than on purely artistic merit, I decided to change the requirement. Now students are asked to select a movie from among the top 25 films on the American Film Institute’s list known as “AFI’s 100 Years… 100 Movies,” which was updated in 2007 from the original list created by the AFI in 1988 to celebrate one hundred years of film-making. While this list is far from perfect, I believe it more adequately presents a collection of films that were either ground-breaking in some way or exemplified the best of a particular genre or format. Over the years, my students have responded very positively to this assignment, and I have enjoyed reading their thoughts and critiques concerning the films on the list. However, with the closing of Blockbuster and other movie-rental outlets, the proliferation of Redbox kiosks, and the increased dependence of many on streaming video services like Netflix, I discovered that many students had difficulty in locating some of the older films on the list. So last year I invested in ownership of all twenty-five movies in DVD format so that I could lend them to my students for this assignment. I already owned six of the movies on the list, and I purchased the remaining DVDs from Movies Unlimited, an online supplier with good prices and an enormous catalog. After compiling my collection, I realized that I had not ever seen ten of these films, and there were several others that I had viewed so long ago that I could barely remember them. If I was going to ask my students to watch these movies, shouldn’t I be familiar with them all? That was the impetus for this new project. I plan to watch all 25 movies in descending order, starting this summer, and then write about each one. If I view one film a week, I should be finished with this plan in mid-November. But knowing that there will be some weekends filled with other activities, I hope to accomplish this goal by the end of 2012. I established this blog with great intentions a few years ago, but I’ve let it slide recently. This project will, I hope, encourage me to keep it more current and to use it as per my original intention. Wish me luck!! BBC America started a new show last night called The Choir. It’s a reality show in which a handsome and likable young man, Gareth Malone (isn’t Gareth a totally British-sounding name? ), visits a typical comprehensive school in a low-income area in England and recruits twenty-five novice singers for a choir. The goal is to establish the choir and work with them until they’re good enough to compete in a choral competition in China, of all places. The school is Northolt High School, and – according to the show and to the BBC press release – it has never had a choral music program. Malone holds auditions and chooses the best from among the many untrained singers who try out. Either the school doesn’t contain older students, or very few of them try out, because one of his first problems is in finding boys whose voices have changed for the bass parts. The few that he does manage to find are very weak, and (like the rest of the kids) totally untrained. Last night’s show followed the progression of announcing the program to the students, holding auditions, forming the choir, and teaching and rehearsing the selected pieces. It culminated with a recording session in which the new choir made a demo CD to submit with their application to the contest. The whole process took only six weeks (I believe), with only one rehearsal per week. The first thing that really jumped out at me was how musically impoverished these children were. They had never had any sort of music education, did not know how to read music or decode a score, and most of them had never even tried to sing in harmony before. The personable Mr. Malone got quite a lot accomplished in the short time that he had, but the choir did not sound very good on their audition recording, I have to say. What distressed me was Malone’s lack of attention to basic singing skills. Perhaps he didn’t feel that he had the time. And of course, the show was edited to focus more on the personal stories of some of the students, since that is what sells reality TV programs. So perhaps there was more vocalization, warm-ups, and coaching than what we saw on the screen. But there’s no doubt that the students were grossly oversinging, and Malone kept prompting them to get louder and louder, without offering any tips on breath support or vocal technique. I have always been suspicious of the “Loud equals Good” school of musical training. The singing was brassy, flat, and raucous – in a way, reminiscent of some of those Eastern-European folk choirs. I realize Malone didn’t have a lot of time, but I would have hoped that, as a classically-trained musician, he would have taken a little more care with the vocal production. If they continue to sing like they were in this first episode, his students will end up with vocal problems by the end of the season. In spite of that, my overall response was positive. For one thing, it made me so grateful to have had musical training as a child. Although Garland schools did not have elementary music programs until well after I had graduated, my parents enrolled me in pre-school church choir, and I continued through the children’s church choir program into high school. My parents were also responsible for buying a piano for our home, and paying for my piano lessons, which started when I was in third grade and continued into college. In Junior High I played flute in the school band, and in high school I added bassoon and xylophone to my repertoire. These musical experiences had a vast impact on my life, and I cannot begin to imagine how different I would be had I not had the privilege of a music education. I watched the children on The Choir as they timidly sang together for the first time, and I could see how they changed and grew as they began to feel the joy of group singing. An especially gratifying moment in the show occurred after the audition recording had been made. Malone arranged to have copies of the CD mailed to each of the choir members, and the cameras caught the children in their homes, playing the CDs for their families and for themselves. One girl’s grandmother began to cry as she listened to her granddaughter’s voice singing among all the others. You could tell that, for this woman, this was a moment of pure joy and wonder. It seems to me that this is the essence of the show – that the joy of singing as a group, as a community, is something of immeasurable value that is in danger of being lost. I know that The Choir was highly successful and award-winning in its British run, and I hope that lots of Americans will tune in to its US broadcast. There are many parts of America in which music education is on the cutting block, and it’s my hope that interest in this TV reality show will engender a renewed interest in keeping the arts in the public schools. The main reason why our road trip plans went wrong was that Erin’s car had a breakdown. If you don’t know what I’m talking about, read the previous post. On Saturday, we had planned to leave early in the morning and drive all day to get to St. Louis, MO. Google maps estimated it as a 10-hour drive. Fine, I thought – we can leave at 7:30, drive 5 hours, stop for lunch at 12:30 or 1:00, then drive another 5 hours and arrive in St. Louis some time in the evening. Sounds like a good plan, n’est-ce pas? Sure. But thanks to a screw-up at the Tom Thumb pharmacy, we couldn’t leave until after 9:00 a.m. because they missed one of my prescriptions that I couldn’t live without. So we left Garland around 9:20. Then, as we approached Allen, Erin remembered that her Crocs had gotten ruined and she really needed a pair, so we stopped at the outlet mall and made a quick visit to the Crocs outlet store there. Back on the road by 10:40 – only 3 hours off target. We could still make it! Well, we made it as far as Vinita, OK. We were just entering the Will Rogers Turnpike when the rear wheels started misbehaving. At first, Erin (who was driving) thought it was just a strong wind, but it got harder and harder to keep the car on the road, and I surmised that we had blown a tire. We limped off the Turnpike and back into town. We headed for the Walmart, but when we got there we discovered that they didn’t have an auto services bay. What kind of a sick, twisted place was this??? At a gas station, we asked a customer if he could recommend a tire shop, and he gave us directions to a nearby place that was, unfortunately but not surprisingly, closed. By this time it was about 4:30 on a Saturday afternoon, and I guessed that almost every place would be closed – probably until Monday. Finally we pulled into a Pizza Hut parking lot. When we got out to assess the damage, we discovered that the tire itself was still intact. However, the entire wheel was leaning out from the car at a wonky angle. With sinking heart, I realized this repair was going to involve more than a simple change of tires. Hearts heavy, we went inside and called AAA. Now I’m going to stop right here and tell you this: if you don’t have a AAA membership, get one! It’s not too expensive (about $75 a year, I think) and it is definitely worth having. The AAA representatives I talked to were kind, generous with their time, and willing to be of help in any way they could. The first lady I spoke with had a cute Minnesota-type accent, and her concern for us and our predicament was crystal clear through the phone lines. With many reassurances, she promised to get someone to us right away. She asked how many passengers were in the car, and when I told her it was my daughter and myself, she said, “Oh dear, two lovely girls, and stranded on the road! Oh dear! Don’t you worry at all, I’m going to take care of you.” I was so charmed by her accent and her sincerity that I forgot to be upset about the car. That in itself was a blessing. Soon after the first call concluded, I received another call from a different AAA representative, who wanted to make sure that we were staying inside the Pizza Hut, out of the heat, because it was such a hot day. She said that we shouldn’t try to wait outside for the tow truck – she would tell the driver to come in and find us so we could stay cool. Another representative called me a little while later to let me know that the truck was on its way. As a whole, they could not have been more helpful or solicitous. The driver arrived a mere thirty minutes after our call. Albert was a lanky, leathery man of about 60. He got down and crawled underneath our car to see what the problem might be, and diagnosed a broken wheel bearing. The shop where he worked was in nearby Miami, but they wouldn’t be open until Monday. He reckoned the same would be true about any of the auto repair shops in the area. I explained about our trip and our plans, and I guess he could see the despair on my face. We were stranded in Vinita. He seemed to chew on this for awhile, and then began to explain his situation. He was not the regular tow truck driver – he was filling in for another guy who was on vacation. He worked part-time for the owner of the towing service, but earlier in his life, he had owned his own garage and repair service. The old facility was next to his house, and he still had all the equipment. But a few years ago he decided to semi-retire in order to spend more time with his grandchildren. He offered to take the car back to his shop and try to fix it. The parts dealerships in the area were all closed, but O’ Riley’s would open up tomorrow morning, and he would get the part and fix the wheel. We wouldn’t have to wait until Monday! I couldn’t believe my good fortune! Albert loaded our car on the back of his truck, and gave us a ride to the nearest hotel, which was a Holiday Inn Express. He waited while I booked a room, and then lowered the car back down so we could pull out our overnight bags. As we watched him drive away from the hotel, it suddenly dawned on me that I had let a total stranger take my daughter’s car away, and I didn’t even know his last name or remember the name of the towing company! I could imagine telling the police that I had allowed some guy named Albert take my car away, and now I wanted it back. My misgivings were allayed, however, when he called me an hour later to tell me that he had taken the wheel apart, and it looked like all we would need was a new bearing, which he could get in the morning. At least he was keeping me posted, and now I had his phone number stored in my phone. We ordered delivery from the same Pizza Hut we had visited earlier, then watched some TV and went to bed early. The next morning we took advantage of the hotel’s continental breakfast, and then negotiated with the manager so that we wouldn’t have to vacate the room until we had heard something – one way or the other – from our repairman. When 11:30 came and went, I started to get nervous. What kind of idiot would just hand their car over to a total stranger? Then my phone rang, and it was Albert, telling me that all was well and that he was bringing the car back to Vinita within the hour. What a relief! What a blessing. Now consider this: we just HAPPENED to break down in Vinita. We could have been way out in the middle of nowhere. Albert just HAPPENED to be covering for someone else that weekend, and he just HAPPENED to have all the tools and knowledge necessary to get the job done. Although the break-down messed up our schedule and caused us to miss s0me of the fun things we had planned to do, I marvel at God’s perfect timing and God’s provision for us in our hour of need. Our Lord was watching out for us, and he used a “good man, a really good man” to meet our needs and show us a glimpse of divine Providence. Recently my daughter and I embarked on a road trip from Dallas to Indiana and Chicago. Some people have heard some of the stories, but I thought I would re-inaugurate my blog (I haven’t posted in ages) by relating some of the stories from that adventure. The reason for the trip was that Erin (my daughter) would once again be participating in the MasterWorks Festival in Winona Lake, Indiana. MasterWorks is a workshop and festival for advanced music students who want to grow as musicians and as Christians. This is Erin’s fourth time to participate, and this year (as last) she is serving as an intern stage manager. She will also sing on several occasions and study voice while there. She wanted to have her car with her this time, so the plan was for me to ride up there with her, have some fun, and then I would take the Amtrak back home to Texas. We planned to visit St. Louis one day and visit the Gateway Arch and ride on a riverboat down the Mississippi River. The next day we planned to spend sightseeing in Chicago. The whole trip was going to last 5 days for me. Erin will be there 5 weeks this summer, come home for a month or so, and then return to work as a full-time intern for the next year. It was a good plan. I was excited about it. I made hotel and train reservations, got maps from AAA, reserved seats for us on the riverboat, and printed off information and maps for all the places we were going to visit. According to Google maps, we’d have a long, 10-hour drive from Dallas to St. Louis on the first day, but a much shorter 5-hour drive from St. Louis to Chicago on the second day. The third day would be spent sight-seeing in Chicago and Winona Lake, and the fourth and fifth days would be devoted to my train trip back home. Good ol’ Robert Burns wrote: “The best laid schemes o’ mice an’ men / Gang aft agley.” We usually modernize the verse by saying, “The best laid plans of mice and men often go awry.” Whether you like the old Scots version or the more modern English paraphrase, the saying is based in truth, as my experiences have often proved. Of all the plans that were made, the only one that came to fruition was the train trip, and it was quite different from what I had expected. To find out what happened, read the following posts!